Candlestick charts are one of the most powerful technical analysis tools in the trader’s toolkit. They are also one of the most prevalent. Most technical analysis programs use candlesticks as the default mode of charting. Used correctly, candlesticks can give a signal in advance of much other market action. They can be a leading indicator of market activity. But familiarity doesn’t necessarily breed expertise. There are perhaps more than 100 individual candlesticks and candlestick patterns. This is a daunting amount of information for a trader to understand and apply. As with most things, some candlestick patterns are more useful than others. Here, we will take a look at some of the most viable for stock traders. These are candlestick patterns that experience shows have the most relevance to making consistently profitable trading decisions. Used correctly, they should increase the accuracy of your predictions. For those not familiar with the details of candlestick charting, it’s important to go over the fundamentals. 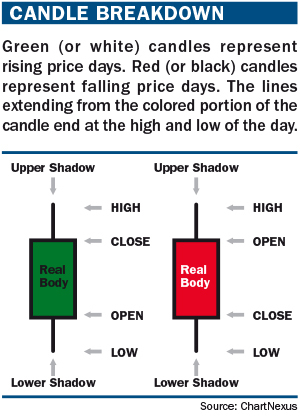 The difference between the open and the close is called the “real body” of the candlestick. The higher of these values creates the upper extreme of the real body, and the lower of these values creates the lower extreme. The amount the stock rose in price above the real body is called the upper shadow. The amount that the stock fell below the real body is called the lower shadow. If the candle is green or white, it means the lower extreme is defined by the opening price and that the stock’s price rose during the period being charted. If the candle is red or black, then the lower extreme identifies the closing price, and the stock fell during the period. Candles may be created for any time period: Monthly, weekly, hourly or even a minute. Regardless of the time frame, candlesticks should not be judged in isolation; traders should always look for follow-up action to confirm any signals during the following applicable period. Bramesh Bhandari is a proficient stock trader at Indian stock market.He share his insight in Forex,Commodity and World Indices through his site http://www.brameshtechanalysis.com. He also provides online tutoring on technical analysis to traders.He can be reached at bhandaribrahmesh@gmail.com.